Inquest into the death of Hawe family in Cavan heard distressing detail of how the four were killed. Dad Alan is believed to have died by his own hand. BROTHERS LIAM, NIALL and Ryan Hawe were all stabbed to death in their beds, while their mum Clodagh died of similar injuries in the sitting room of their Cavan home, an inquest has heard. Deputy State Pathologist Dr Micheal Curtis gave evidence this afternoon to the inquest into their deaths and that of their father Alan. He had pronounced the five Hawe family members dead in their house at Castlerahan and carried out full-postmortem examinations in the following days in August 2016. Clodagh, 39, who had been found face down on a settee in the sitting room of the house, had died as a result of a stab wound to the neck and axe blows to her head, Curtis said. There was also evidence of a possible defensive injury to her hand. Liam, 14, Niall, 11, and six-year-old Ryan all died as a result of similar stab injuries to their neck, which severed their windpipe. Answering questions from the coroner, Dr Curtis said it was difficult to believe the manner of the boys’ killings was entirely coincidental and said that the incisions had rendered the victims unable to make a sound. Alan Hawe’s body was found in the hallway of the house. Asked whether there was any evidence any other party was involved in his death, the pathologist replied “none whatsoever”. Toxicology reports for all five family members were returned as negative – there was no evidence of drugs or alcohol in any of their systems. Dr Curtis said it wasn’t possible to say for certain in what order Clodagh and the three boys had been killed – but said it was likely Clodagh and Liam, the oldest boy, were killed first as their attacker attempted to reduce the possibility of being stopped. Possible defensive injuries were evident on the hands or arms of the mother and the two older boys but not on the body of Ryan, Curtis said. Several family members sobbed as Dr Curtis gave his evidence, and there was an audible gasp at some of the detail relating to the killings of the boys. The inquest into the deaths opened this morning in Cavan courthouse. It had heard from the mother of Clodagh Hawe that she had immediately thought “something terrible had happened” when she arrived at her daughter’s door on the morning of 29 August 2016. Schoolteacher Clodagh Hawe and her three children Liam, Niall and Ryan were found dead in their home on Monday 29 August 2016. Her husband Alan, father of the three boys, was also found dead at the house. Local gardaí, specialist garda experts and family members gave evidence at the courthouse this morning before Coroner Dr Mary Flanagan and a jury of seven. Mary Coll, Clodagh’s mother, told the inquest that she was expecting her daughter to call over to her house on the morning of 29 August with two of her youngest sons, Ryan and Niall, after she had dropped Liam off to school. Clodagh’s family, including Alan, had called over to Mary’s house the previous evening, a Sunday. Mary said she had served tea and biscuits and chatted to Alan and Clodagh while the three boys were in another room. It had been a general chat, she said. They talked about the Lotto numbers, and Mary wished Alan luck as he was due back at work in Castlerahan National School the following morning, where he worked as vice-principal. He wasn’t looking forward to going back, Mary Coll told the courtroom. He had thanked her for the tea and biscuits before getting in the car. Mary Coll said she remembered the family had to leave a little early that night because six-year-old Ryan was due a bath, but Clodagh said to expect her and two of the boys the next morning. On the Monday morning, Mary Coll said she began to get worried after her daughter didn’t arrive at the expected time. She recalled how she had first called Alan Hawe’s number when Clodagh didn’t arrive as she thought Clodagh would be driving. She then called the house phone and Clodagh’s own mobile, before deciding to go over to the house herself. She knew something was wrong when she saw two cars in the driveway of the home, she told the inquest – and suspected carbon monoxide poisoning. She went to the back door and took out her key – but noticed a note taped to the inside of the glass, telling her not to go inside and to call the gardaí. She recognised it as Alan’s handwriting. She immediately called 999 and waited for help to arrive. She called into a neighbour and said she thought “something terrible had happened”. “I think Alan has done something terrible and he killed them all,” she remembered saying. Garda Alan Ratcliffe and Garda Aisling Walsh were first on the scene, they told the inquest. Garda Ratcliffe got a call telling him to go to the house at 3 Oakdene Downs, where he met Mary Coll. He observed the note on the back door, and told the inquest how he proceeded into the kitchen and then through the downstairs of the detached house, where he found the bodies of the two parents. The body of Clodagh Hawe was found in the sitting room. The body of Alan Hawe was found in the hallway. Upstairs the bodies of the two older boys, Liam and Niall, were found in beds in one of the bedrooms. The body of six-year-old Ryan was found in a smaller room, also in a bed, the officer told the inquest. Garda Ratcliffe said it was clear there were no signs of life. Two weapons were found in the sitting room downstairs – a knife and a small axe. One weapon, a knife, was found in the same bedroom as the youngest child. The two gardaí called for backup from the house. 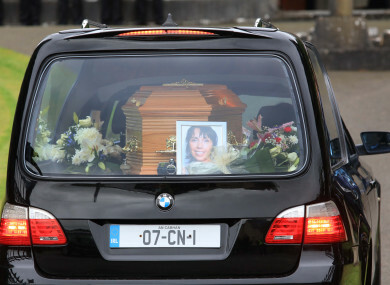 Garda Walsh also inspected the scene, and gave the same details to the inquest as her colleague. The proceedings were paused as Garda Walsh broke down briefly while recounting how she came across the bodies of the children. The coroner, Dr Flanagan, said no-one could imagine having to go through that experience. More local gardaí arrived and the scene was sealed off. A specialist team from the Garda Technical Bureau later arrived, and began to conduct their forensic inspection. Detective Sergeant John Grant of the Technical Bureau said he recorded that all the doors and windows were locked at the house. He described how he had supervised the examination of the scene, liaising with the technical unit at Bailieborough Station. Dr Michael Curtis, Deputy State Pathologist, declared the deaths that afternoon. The bodies were removed from the scene via hearse to the morgue of Our Lady of Lourdes Hospital in Drogheda. In addition to the note taped to the inside of the glass on the back door, two additional pieces of handwriting evidence were also located at the scene – a note written on an A4 sheet of paper and a three-page letter enclosed in a white envelope were found on the kitchen table. The knives, axe, notes and letter were examined by various specialist gardaí in Dublin in the days following the discovery of the bodies at Oakdene Downs. A Garda fingerprint expert said he inspected the axe discovered at the scene and matched it with the palm print of Alan Hawe. A second fingerprint expert, who examined the three-A4 page handwritten note found in the house, said he was in “no doubt” that marks found on one of the pages were left by the left ring finger and left middle finger of Hawe. A Garda handwriting expert inspected the notes and the three-page letter and compared them to previous handwriting samples from Alan Hawe. He said there was “conclusive handwriting evidence” that he wrote the notes and letters. Evidence of Rodney Lakes of Forensic Science Ireland was also read to the inquest. His purpose in the investigation was to examine the bloodstains found at the scene, he said. As part of his investigation, he said he determined that one of the envelopes left in the kitchen was stained with blood that matched a DNA profile for Alan Hawe. Beginning proceedings shortly after 10am in courtroom 2 of Cavan Courthouse, Dr Flanagan said it was a “particularly emotive” inquest. She explained to the full courtroom that an inquest was tasked with establishing the facts surrounding a person’s death, and that seven verdicts were open to it: accidental death, death by misadventure, open verdict, natural causes, suicide, death by unlawful killing and narrative verdict. You can contact Women’s Aid on 1800 341 900. Email “Hawe children were stabbed to death in their beds while mum Clodagh died in sitting room”. Feedback on “Hawe children were stabbed to death in their beds while mum Clodagh died in sitting room”.